The Burberry Prorsum Fall 2015 collection, 'Patchwork, Pattern and Prints' showcased 70's inspired chic bohemian style. Floral and fringe dominated the runway and each look was as inspiring as the last. The suede fringe cape was my favorite. The elderberry colored cape retails for €7,250! You can buy a similar style at Mango in cognac for €99,99! This neutral color would look great paired with dark denim and bordeaux over-the-knee boots. The Burberry Prorsum show always introduces a new style of handbag featured in that seasons favorite colors and embellishments. The Fall 2015 collection showcased the 'Bucket Bag' in two sizes, prints, suede and of course fringed. 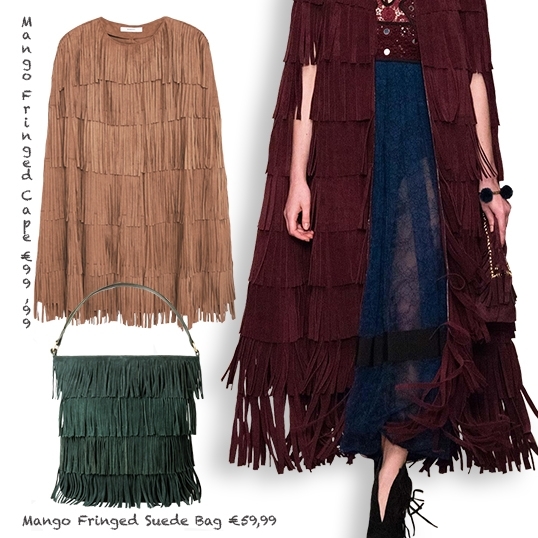 Pictured here is a dark green fringed suede bag by Mango. Bucket shaped, jewel tone and fringed - embodies everything necessary to pull off a Burberry Prorsum inspired look. Christopher Bailey is undoubtably my favorite designer and the Burberry Prorsum show is my most anticipated throughout fashion month. This 70's inspired collection was titled Patchwork, Pattern and Prints - I couldn't have said it better. 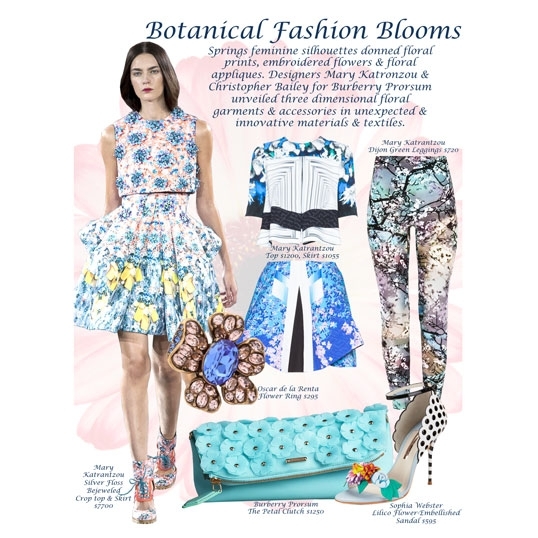 The bohemian looks were comprised of paisley and floral prints in blue, red, olive green and gray. Patchwork and fringe were the dominant features in this collection. Capes, ponchos, booties and the bucket bag showcased heavy fringe in jewel tones and classic dark tan. 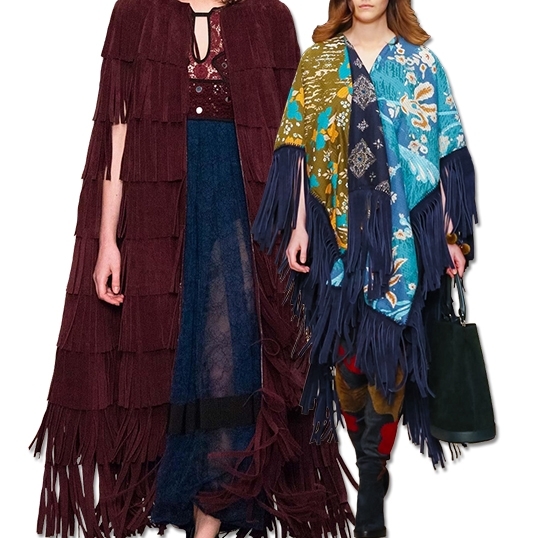 The patchwork fringed poncho will definitely be the "it" piece this fall (as was the monogrammed Prorsum poncho from fall 2014). Paired with over the knee suede patchwork boots, bed-head hair and round sunglasses - the epitome of 70's chic. The navy shearling cape is gorgeous and timeless (my favorite piece). And I'm coveting the patchwork fringe booties. This collection is alluring, nostalgic and inspiring. I'm an avid on-line shopper! 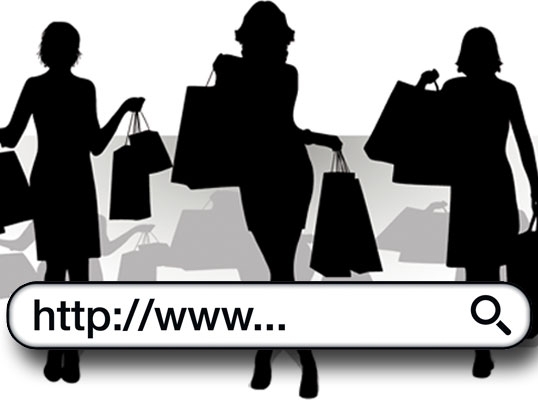 I make 85% of my fashion and cosmetics purchases on-line, rather than visiting malls or shopping street side stores. Shopping on-line is superior to in-store shopping mostly due to the vast selection and ability to search for items unavailable in your area. On-line apparel and accessory sites like Shopbop and NET-A-PORTER publish lookbooks that showcase items from various designers/labels together - it's like having a personal stylist. The photos provided for each item allow you to see how the garments fit and which items to pair it with. Clothes look better on a model than on a hanger.. I luv lookbooks! Magazines are also a great media for inspiration and list every item, so you can search the internet and purchase anything that is published. Harpers Bazaar magazine has launched an on-line shopping site that allows readers to browse and purchase many of the items in the magazine. My fashion inspiration often comes from magazines and lookbooks. My morning ritual consists of coffee and browsing on-line shopping sites. First on my list is Shopbop. This site carries many of my favorite designers/labels and posts new items each day. Shopbop stylists have great taste and showcase different brands together well. There is a section under each item "wear it with" that allows you to recreate the outfit pictured. Shopbop also publishes great lookbooks daily. They currently have 862 brands (I counted), such as Alice + Olivia, Phillip Lim, Elizabeth and James, as well as premiere designer names like Saint Laurent and Marchesa. Shopbop has a vast selection to suit everyones personal style. Shopbop has free shipping and returns. Included in your package you will find a prepaid return label that ensures a free return if you send the item back within seven days of receiving it. 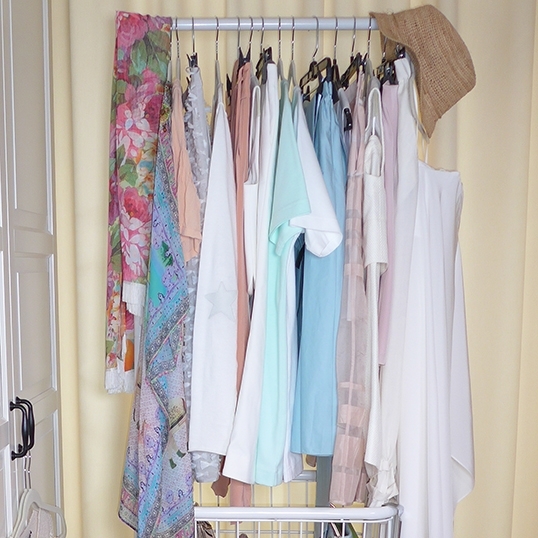 This allows you enough time to try on your items and decide whether you will keep them. I recently discovered NET-A-PORTER and quickly became obsessed with browsing the new arrivals, the magazine's page, and the stylish combinations of apparel and accessories showcased listed under "how to wear it". Each item has photos from many angles, up close so you can see the material and full body shots. What sets NET-A-PORTER apart are the videos posted next to each item showcasing the look. NET-A-PORTER has brands I haven't seen on another on-line shopping site, like Kate Moss for Topshop, and high brands such as Victoria Beckham, Stella McCartney and Proenza Schouler. If anything, this site will inspire you! 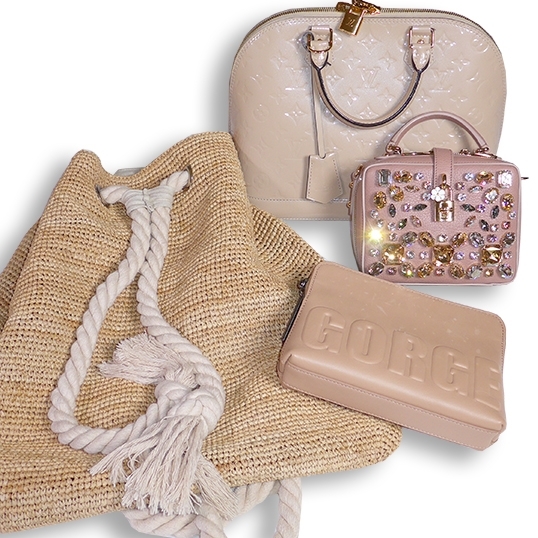 For premiere designer items my go-to on-line shopping site is Shop Bazaar. If I had to sum up this site in one word - trendy! There are currently 330 brands including Burberry Prorsum, Dolce & Gabbana, Emilio Pucci, The Row... It's designer apparel and accessories heaven! There is a "In the Magazine" page featuring items from the latest edition, as well as a "Trends" page for current fashion inspiration. Miami Fashion Week with my girlfriends!